We all know Masaba Gupta’s bold and eccentric sense of fashion and style - well, it’s no surprise then that this season’s collection danced around the same. 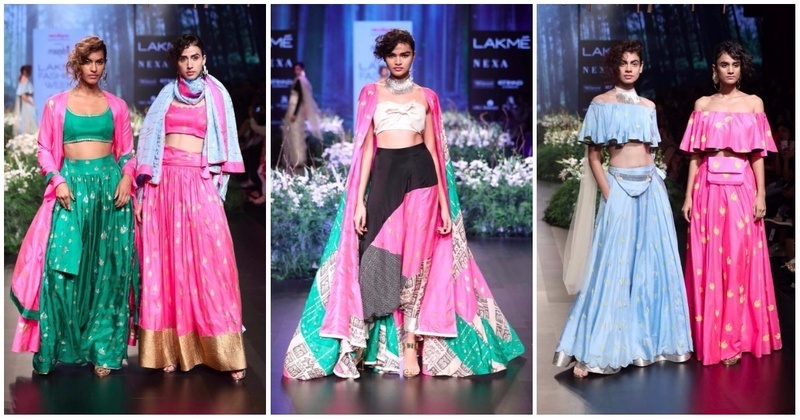 The collection was a balanced blend of contemporary and traditional elements - with mod silhouettes fused into lehengas and sarees that had heritage worli and tribal embroidery on them. A patchwork lehenga with a matching lehenga and a white bow-tie tube stood out. The garments had a range of colours from pops of bright hues like rani pink, emerald green and the sorts to an achromatic palette of black and white. Lehengas had off-shoulder cape-style silhouettes while sarees were seen with a corset. The garments were highlighted with hints of gold and silver.